1. 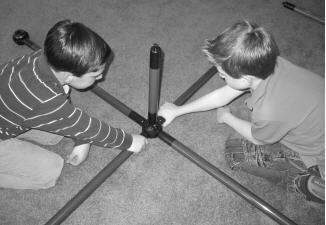 Construct a cross shape using four of the 36″ Toobeez tubes with one sphere in the center joining the four tubes. Also connect a sphere to the end of each 36″ Toobeez. These will serve as the X and Y axes for the Cartesian plane playing board. Teacher Note: The should be northern and eastern tube should be the same color. Likewise, the southern and western tubes should also match in color. This serves to reinforce the negative and positive values long the X and Y axes of the playing board. 2. Place one 36″ x 36″ square of chart paper or oak tag in each quadrant of the constructed Cartesian plane. Using a meter stick and marker, students should draw a straight line along the X axis every 8.6 centimeters. These lines should be parallel to each other and extend the length of the chart paper in each quadrant. 3. Have the students note the appropriate of each positive or negative values of each line along the X axis on the chart paper. 4. Repeat Steps 2 and 3 for the Y axis. The result is a 2-D grid pattern. 5. Using Toobeez pieces and curtains, have students construct a dividing structure, as shown, equal in length to the X axis. This partition is constructed along the X-axis by placing two Toobeez curtains vertically on each side and then rolling up the curtain from the bottom to tighten. This partition will divide the Toobeez Cartesian plane playing board in half. You are now ready to play Toobeez Battleshapes. 6. In addition to using the Toobeez game board, each student should be provided with a sheet of graph paper. Before the activity, have students draw a Cartesian plane model on graph paper to ensure understanding. Review the difference between positive and negative numbers. It is helpful to review mathematical operations using positive and negative integers. 1. After dividing students into teams, each team should construct three two-dimensional geometric models using Toobeez (one triangle, one square, and one pentagon) to serve as their battleshapes. Challenge: Each group must try to “sink” the opposing team’s Toobeez battleshapes using knowledge of the Cartesian plane system. 3. Using markers, each team should secretly plot their three battleshapes on their side of the Toobeez Cartesian plane playing board curtain. Each sphere of the models constructed in Step 1 should serve as a point on the Toobeez Cartesian plane. 4. After plotting all three battleshapes, each team should also write the coordinates of each point on their team’s playing board for their own easy reference during play. 5. Taking turns, teams should call out coordinates in the appropriate manner (X,Y), and be mindful of positive and negative values. 6. If a team calls out a point that corresponds to the plotted point of an opposing team’s battleshape, it counts as a hit. Whenever a team guesses all the plotted points of an opposing team’s shape, that shape is considered to have been sunk. Guesses that do not coordinate with the plot points are misses but can aid in the process of elimination to guess the correct coordinates. 7. From the coordinates they call, team members should record their hits and misses on both the playing board and their personal plane handouts to prevent recalling the same coordinates. 8. The first team to sink all the opposing team’s battleshapes by identifying their plot points wins! Assign drawings of geometric figures with specific coordinate points. Have the students properly name the coordinates of all vertices. Assign each student three more advanced geometric shapes. 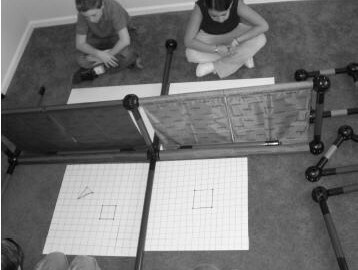 Pair these students off and let them play “Battleshapes” at their desks using Cartesian planes drawn on graph paper. How is a coordinate system useful in math? How did the coordinate system and recording “hits and misses” aid the team in locating hidden battleshapes? Why/how can a coordinate system be useful in everyday life? How can the Cartesian plane two-dimensional system be enhanced? Increase the sizes of the battleshapes used by each team. For example, use hexagons and octagons. 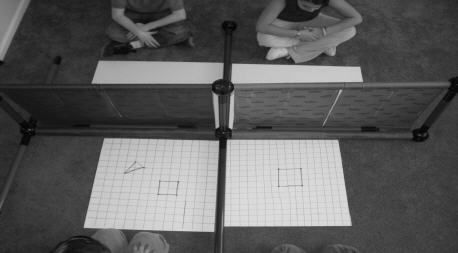 Make four student teams and subdivide the Toobeez Cartesian plane playing board, making each quadrant a playing field. 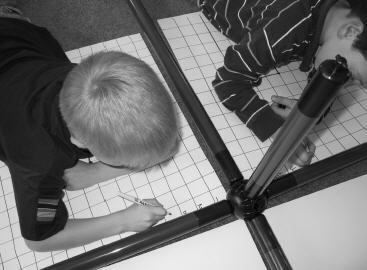 Using a fresh Toobeez Cartesian plane playing board, guide the class in identifying coordinate points of shapes drawn on the Toobeez Cartesian plane.